42 pages : illustrations, maps ; 23 cm. John W. Griffin and Ripley P. Bullen. site, this publication is dedicated to Mr. Lucius S.
about twenty feet in height border the water on two sides of the site. that the mound is located at the east end of Phillippi Point. is little or no debris back of the slight ridge paralleling the shore. the burial mound, excavated some years ago by Stirling (Fig. 1). grove. The village continues across the road shown on the map. story of the man. This is, however, unnecessary for present purposes. 1 Straub, 1929, p. 33. 2 See for example McKay (1946) and Sands (1948) in the Tampa Tribune. 3 Microfilm in the P. K. Yonge Library of Florida History, Gainesville. 4 An eyewitness account of this hurricane is in Bethel (1914, pp. 63-64). later.5 Count Phillippi died in 1869 ; his grave is on the site (Fig.l). Stirlings work at the Safety Harbor site. Park Service. In May he dug several test holes in the village. our work most pleasant despite the late summer temperatures. excavations may be seen on Figure 1. T Moore, 1900, p. 356. 8 Stirling, 1930, p. 186. 10 Stirling, 1936, p. 353. 11 Willey and Woodbury, 1942, p'p. 235 and 245.
,2 Goggin, 1947, p. 118; Willey, 1948, p. 213. 18 Willey, 1948, pp. 213-214.
tion about collections at the United States National Museum. granted, and resulted in protection of the mound. and with the Pinellas County Park Board. toward the crumbly, contorted end of the paste range as defined. small triangular notches at the outer edge of the lip, (PI. I, Y). the few unique, deeply indented, rims are illustrated (PI. I, Z-BB). Incised at this site varies somewhat from the paste of Pinellas Plain. site, the paste is toward the coarse and contorted end of the range. at Safety Harbor. Lake Jackson Plain handles are illustrated (PI. the design is executed solely by incision (PL I, T-U). St. Johns Plain and St. Johns Check Stamped. Named by J. B.
rather than a chalky paste (PI. I, V-W). are yellow glazed on both sides. only on crumbly Safety Harbor paste. at nearly right angles to give a diamond-shaped pattern. occur; one of them is decorated like Safety Harbor Incised (Pl. I, S). lines which oppose each other, giving a herringbone-like pattern. cal concave flutings, probably from scraping. curvate sides (PI. II, A-B). They are about % to 1 inch in length. duced by flaking. Six long, narrow triangular points are serrated. Eight have small lateral extensions of the base similar to ears. One is both eared and serrated. much wider, about % of an inch in this respect. has serrated edges and a concave base. short wide point with beveled edges. balance are smaller and about the same size and shape as the barbs. the outline of the stem may be curved. 28 Lewis and Kneberg, 1947, p. 18. (PI. II, S) and one has an expanded, side-notched base. typical. A few are illustrated (PI. II, T-AA). fairly broad, with excurvate sides and convex or straight bases. row blade, 4 inches long, is also included in this category. edge or may be the result of use. the assumption they were used for light percussion flaking (PI. Ill, I). concave smooth surfaces (PI. IV, O-P). 3/16 of an inch deep, % of an inch wide, and 5% inches long. diameters. The top is flat and the bottom smooth and slightly convex. discoidal is 2i/2 inches in diameter and one side is slightly concave. neous rock. The one of slate is rectangular in cross-section. (PI. Ill, F, G, D-E). semi-annular head formed by leaving part of the wall of the bone. This detail cannot be seen in the illustration (PI. IV, G). and may therefore, be refuse from the manufacture of bone pins. scraped with a sharks tooth. 31 Goggin and Sommer, 1949.
and then compare the materials from the other collections. axis of the mound, is given in Figure 2.
be 23 to 29.5 inches thick, resting on a gray-white sand. were noted. Whether or not these were human bones is not certain. constructed by adding material to a smaller burial mound. debris, and some clay was used in the construction of the mound. been washed out from the mound by a storm. of Old Tampa Bay near the site, where such clay may be found today. of lumps of clay forming a zone one to four inches thick. monly found on pyramidal mounds throughout the Southeast. Several post holes were found in the upper part of the mound. proximating that of the present surface of the mound. and the top of the deposit of mixed shell and debris. by the addition of sand and other materials, including many shells. added, larger than and partly overlying the first floor. zone of mixed shell and debris. occurred at a level equivalent to present depths of five to seven inches. sherds and by pits and post holes leading downward from that depth. fragments of iron found in small quantities in the upper one foot. the 1933 excavation mentioned earlier. support to the upper occupation zone or zones postulated above. be discussed at a later point. point (PI. II, L) was found in the 24-30 inch zone. three utilized chips and four scrapers. coral rock, and some burned sandstone fragments. of shell artifacts from the mound. possible bone tube (PL IV, M). was investigated by means of an interrupted exploratory trench. and finally sterile yellow or yellow-brown sand. Area C. Area C is included in the main village area of the site. were not abundant west of Stake 13.
made the delineation of post hole patterns impossible. main living area was where the pits and post holes were found. cultural debris among the shells. ware attributable to this period were found in the upper twelve inches. points has been mentioned earlier for the large mound. bone, scraped with a sharks tooth, completes the artifact inventory. daub construction at the site. site are available for comparison. A small collection in the U. S.
terial in the Florida State Museum, collected from the beach by T.
Wolf, all of Tampa, who surface collected the area from 1917 onward. a short distance northwest of the large mound. about the same ceramic picture for the site. cavations triangular points overlay stemmed points. is indicated by their inclusion in the Florida State Museum collection. Melongena or Strombus hammers ..
of the burial mound is shown in Figure 1.
showed the mound to have been built in stages. were secondary in nature and were placed in no particular order. with the Leon-Jefferson period, are present in this collection. large mound and in the village area. been treated in the anthropometric analysis. 35 Records, Florida Park Service. width nose. No evidence is available for the long bones. of the Roman Period, and Neanderthal, Upper Palaeolithic, and Mesolithic peoples. Casual perusal of the literature for North America shows it to be quite consistent. 38 Krogman, 1939, p. 7.
tions, and the materials recovered by us and other investigators. postulation of agriculture for the site seem probable. the actual living area of the village has been previously mentioned. from land forms, and were probably simply gathered. but birds and other small game were also hunted. no doubt was important, as it is with most primitive peoples. of the techniques of pecking and grinding stone artifacts. Bone and shell were cut, sawn, and ground into various artifacts. Weeden Island Period of the area. and the use of marine life as food. surfaces, and indirectly implied by the net weights. smoothing was probably done with sand and water abrasion. site. What may we glean from ethno-historical sources? burial, a practice noted in the burial mound. at the site, is substantiated by this reference. 40 Swanton, 1946, p. 196. 41 Swanton, 1922, p. 374. 42 Swanton, 1946, p. 196. 43 Swanton, 1922, p. 353.
to speculate in any detail. ably fall in Agriculture II. sions of value can be extended to our material. 47 Hobhouse, Wheeler, and Ginsberg, N.D.
48 See, for example, Braidwood (1945). the period as represented in our excavations is rather homogeneous. within historic times, perhaps a hundred years or more after De Soto. Spanish sherds at the Safety Harbor site. ceramic differences within the time range covered by the term Ft.
of them, Pinellas types which occur also at the Safety Harbor site. M Smith, 1948, p. 316. 51 Willey, 1948, p. 217.
generate children of the classic Weeden Island Incised. characterized by the Pinellas types. The northern origin of Pinellas Incised is a distinct possibility. themselves felt on the central Gulf coast. figures, one of which shows a dominance of the type. the name Pinellas Incised is not too apt. parent than real, and is primarily taxonomic. of the continuum, are more informative. and continued well into historic times, perhaps as late as 1700 A. D.
tion) and Leon-Jefferson periods of the Florida northwest coast. 1950. An Indian Stone Saw. The Florida Anthropologist, vol. 2, pp. 47-48. 1914. History of Pinellas Peninsula. St. Petersburg, Florida. ida. New Haven, Conn. (Mimeographed). Florida. American Antiquity, vol. 13, no. 2, pp. 114-127. Menasha, Wise. pological Association, Bulletin, no. 1. Gainesville, Florida. (Mimeographed). and His Neighbors, 3. W. Griffin, editor, pp. 13-44. Winter Park, Florida. Publications in Anthropology, no. 41. New Haven, Conn.
Area in Florida. Journal of the Washington Academy of Sciences, vol. 35, no. 7, pp. 218-227. Washington. His Neighbors, J. W. Griffin, editor, pp. 45-54. Winter Park, Florida. Eastern United States, J. B. Griffin, editor. In press. N.D.5. Test Excavations at the Lake Jackson Site. American Antiquity. N.D. The Material Culture and Social Institutions of the Simpler People. National Museum, vol. 87, pp. 315-464. Washington. Law Enforcement Bulletin, vol. 8, no. 8. Washington. pology Papers, no. 2. Knoxville, Tenn.
1946. Colorful French Count Planted First Citrus Grove in this Area. Tampa (Florida) Tribune, Dec. 29. Academy of Natural Sciences of Philadelphia, n.s., vol. XI, pt. 3, pp. ida) Morning Tribune, Feb. 4.
no. 1, pp. 55-66. Philadelphia. tiquity, vol. 13, no. 4, pp. 313-319. Menasha, Wise. plorations and Field Work of the Smithsonian Institution in 1929, pp. and Field Work of the Smithsonian Institution in 1930, pp. 167-172. 1929. History of Pinellas County, Florida. St. Augustine, Florida. Ethnology, Smithsonian Institution, Bulletin no. 137. Washington. Memoir, no. 69. Menasha, Wise. Florida. Annual Report of the Smithsonian Institution for 1879, pp. ican Antiquity, vol. 13, no. 3, pp. 209-218. Menasha, Wise. tions in Anthropology, no. 42. New Haven, Conn.
ican Antiquity, vol. 7, no. 3, pp. 232-254. Menasha, Wise. CC-DD, Random punctated; EE-FF, St. Johns Check Stamped; GG, ring base. H, R, S, and X from surface collections, balance excavated. Plate II. Chipped Stone Tools. utilized flakes. D, I-J, from surface collections, balance excavated. Plate III. Plummets, Shell Tools, Daub, and Hammerstones. forated Venus shell; H, fragment of daub; I, chipping hammer; J, hammerstone. tube; N, pottery hone; O-P, fragments of grindstones. 1. Two Archeological Sites in Brevard County, Florida. Hale G. Smith. 31 pp., 2 figs., 4 pis. Price $0.50. 2. 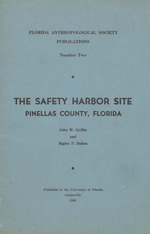 The Safety Harbor Site, Pinellas County, Florida.